Cook is now free to sign with another team. 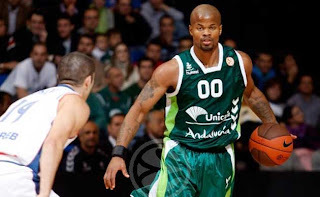 Omar Cook(1.86-PG) didn't renew with Malaga after all, according to acb.com. The American point-guard was asked to extend the deadline for renewing his contract but Cook didn't go for it. Hence Malaga decided to exercise the clause in the contract so it was mutually dissolved. From a prolific scorer Cook has changed his style of play to become one of the best passers in Europe and the ACB as well. Furthermore he holds a Montenegrin passport from his time with in the Adriatic League playing for Red Star Belgrade and he is also a member of the Montenegrin National Team. Cook averaged 9.8 points 1.8 rebounds and 5.9 assists in 16 games playing for Malaga in the Euroleague.